Grimsby moved to within a point of the Conference play-off places after easing to victory over Dartford. Defender Carl Magnay netted from close range after 13 minutes after Nathan Arnold's pinpoint cross, before the winger doubled the home side's lead just before the break. The in-form Lenell John-Lewis scored from the penalty spot three minutes from time after being brought down. Dartford stay in the relegation places after their eighth league defeat. 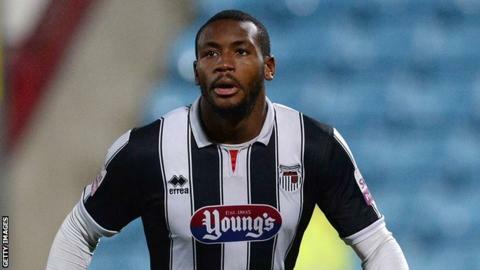 John-Lewis has now scored six goals in his last four games after hitting the net twice in Grimsby's FA Cup fourth qualifying round win over Guiseley last week. "If hadn't have got the victory today we know what sort of comments would have been made so we knew it was important to win. "We haven't quite managed to get into that top five but it extends the run that we are currently on. "Once we got to 2-0 I thought we looked relatively comfortable but I would have liked to have got that third earlier." Match ends, Grimsby Town 3, Dartford 0. Second Half ends, Grimsby Town 3, Dartford 0. Patrick McLaughlin (Grimsby Town) hits the woodwork with a left footed shot from outside the box. Foul by Tom Bradbrook (Dartford). Attempt saved. Harry Pell (Grimsby Town) header from the right side of the box is saved. Foul by Harry Pell (Grimsby Town). Substitution, Grimsby Town. Patrick McLaughlin replaces Craig Disley. Substitution, Grimsby Town. Ross Hannah replaces Nathan Arnold. Hand ball by Jon-Paul Pittman (Grimsby Town). Goal! Grimsby Town 3, Dartford 0. Lenell John-Lewis (Grimsby Town) converts the penalty with a right footed shot to the bottom left corner. Mathew Mitchell-King (Dartford) is shown the yellow card for a bad foul. Penalty conceded by Mathew Mitchell-King (Dartford) after a foul in the penalty area. Penalty Grimsby Town. Lenell John-Lewis draws a foul in the penalty area. Attempt saved. Harry Pell (Grimsby Town) right footed shot from the left side of the box is saved. Assisted by James McKeown. Substitution, Grimsby Town. Jon-Paul Pittman replaces Jack Mackreth. Offside, Dartford. Danny Harris tries a through ball, but Danny Harris is caught offside. Attempt missed. Tom Bender (Dartford) right footed shot from outside the box misses to the right. Attempt missed. Nathan Arnold (Grimsby Town) right footed shot from outside the box is too high. Attempt missed. Jack Mackreth (Grimsby Town) right footed shot from the right side of the box misses to the right. Attempt saved. Harry Pell (Grimsby Town) right footed shot from outside the box is saved. Substitution, Dartford. Tom Bradbrook replaces Luke Daley. Substitution, Dartford. Ryan Hayes replaces Harry Crawford. Attempt missed. Peter Sweeney (Dartford) left footed shot from outside the box is too high. Assisted by Peter Sweeney. Offside, Grimsby Town. Lenell John-Lewis tries a through ball, but Lenell John-Lewis is caught offside. Foul by Luke Daley (Dartford).